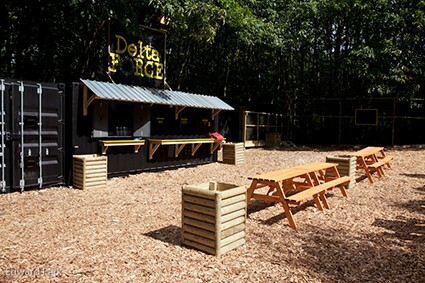 Kegworth Paintballing at Delta Force Paintball Nottingham sits in lush woodland just off the M1 motorway at junction 24. It has a great range of game zones for customers to explore and top-class facilities in the base camp. It’s a fun outdoor activity suitable for both sexes and all ages! So, why not organise a fun family day out paintballing? Set in the picturesque Nottinghamshire countryside, the Kegworth paintballing venue plays host to six outstanding game zones, including ‘Tomb Raider’ which features a huge Egyptian-style pyramid surrounded by tunnels and statues, ‘Castle Wallenberg’ a massive two-storey fortress, ‘Mad Murphy’s Jungle Attack ’ where players need to locate a wounded airman somewhere deep inside the rainforest, ’ Viet Cong Village’ featuring several abandoned village huts for players to take cover in,‘The Haunted Graveyard’ where creepy looking tombstones and an old church can be found and ‘Afghan Fort’ where participants need to infiltrate the opposition’s stronghold and destroy it with fake explosives. 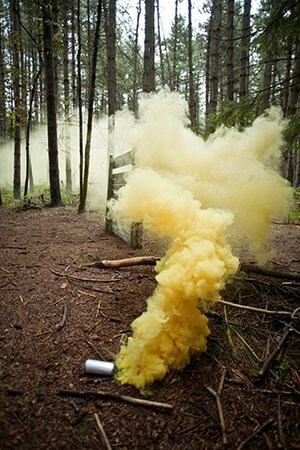 Players over 18 can also use our awesome range of paintball pyrotechnics including smoke grenades, paint grenades and MK5 Thunderflashes to add a bit more drama to their game! All Delta Force Paintball centres provide first class facilities at basecamp to ensure your time at the centre is a pleasant experience. We have proper flushing toilets on mains water (no disgusting porta-loos! ), open and covered picnic areas with lots of seating available and secure lockers for guests to store their valuables in (for a small fee). Delta Force can also provide you and your group with hot pizza lunches, freshly prepared by an offsite catering company. These can be ordered in advance at the time of booking or on the day itself. If you’re celebrating your birthday with us, you are more than welcome to bring a birthday cake as well. The paintball equipment at Delta Force Paintball is top-quality; we supply high-spec semi-automatic paintball guns that are well looked after and maintained by experts. Our safety gear is also regarded as the best in the business! We provide our customers with full-head safety goggles, complete body armour and combat suits with padded neck collars – we place the utmost importance on your safety and well being at Delta Force Paintball. For further information on Kegworth paintballing, or to organise your special paintball event with us, call the booking office on 0203 869 9301 and speak to one of our friendly advisors.